Age of Empires: Definitive Edition is almost everything an Age of Empires fan could think they want. Unless they want the castles from Age of Kings. An introduction: AoE:DE takes the original 1997 game, throws in its expansion Rise of Rome, cleans up the visuals, makes a few UI changes and sets it loose in 2018. I haven’t played this game in years, so it’s been interesting sitting down with it well into the 21st century and finding how much of it still works, and how much of it doesn’t. Age of Empires was a strategy game that mixed the frantic clicking of WarCraft with the technological advancement of Civilization, combining them into an RTS that was bigger, bolder and smarter than most of its late-90s competition. At the time, it was a revelation. Two decades on, though, and you can maybe understand why we’re going so long between Age of Empires III and IV. AoE:DE isn’t a full-on remaster, like say Shadow of the Colossus. The entire game hasn’t been rebuilt from the ground up, so if this is your first time time encountering the series, you’ll find many things about a bit old-fashioned. The AI still skitters around the map like a coked-up spider, for example. Combat lacks any real sense of tactical control. And a modern game wouldn’t have just copied (mostly) the same unit roster across such culturally diverse factions. Those are significant things! Deal-breakers, even. But then, this isn’t a game for the Age of Empires newcomer. This one’s for the fans, especially those who might have played the game to death in the 90s, moved on with their lives and now want to indulge in a little strategic nostalgia. For them, the fact this collects everything in one package, cleans up the UI a bit, and runs nicely on modern PCs with modern resolutions, makes it a nice comfort play. It plays exactly as you remember it, all the tech trees are the same, the wololo is still there (albeit re-recorded, since there are new units vocals), this is Age of Empires, it just looks nicer. The game’s page presents this as an upgrade, but there was a charm to the old pixel art that the modern units are lacking in. Well, in theory. Visuals are a subjective thing, I know, but I’m just not feeling the graphics overhaul here. The game’s speed and isometric viewpoint were perfectly suited to pixels, and the original’s designs look great even today. 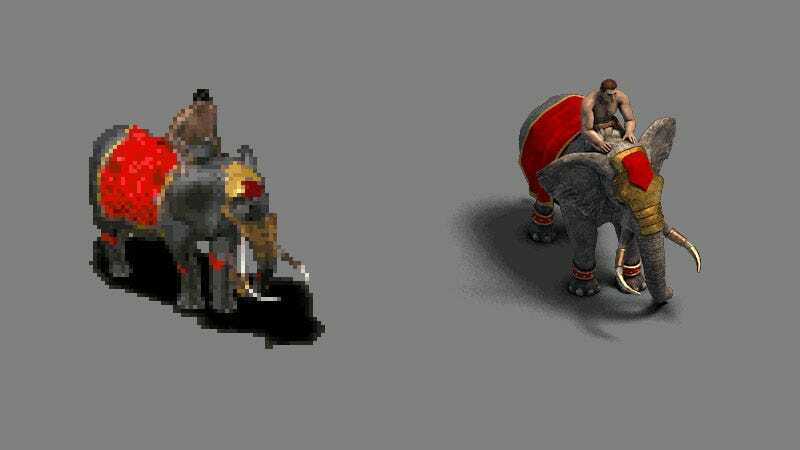 Swapping those out for cleaner units and buildings makes the whole game feel more sterile, and I wish instead of going for the obvious “hi-res” option they’d instead opted for a more loving restoration of AoE’s pixel art. I’m also surprisingly not that into Age of Empire anymore. I loved this game growing up, loved Age of Kings even more, but going back today and playing it I’ve been put off by the amount of tedious micro-management it demands of you, and how erratic and simple-minded the AI behaves, particularly its harvesting and base attacks. With everything that’s come since AoE in the realms of both RTS and strategy, from its own sequels to Total War, I just didn’t find much here to grab my attention for more than a few hours’ blissful nostalgia. AoE’s formula may have been revolutionary in 1997, but in 2018 its fundamentals are not.